Ten years actually goes by pretty quick. I found myself thinking about that while sitting out on Bryant Drive Saturday, watching the procession of crimson & white & purple & gold heading towards Bryant-Denny Stadium, taking the sights, sounds and smells of game day in Tuscaloosa (an experience I can't quantify in words, and words are my profession). Ten years actually went by in a real hurry. 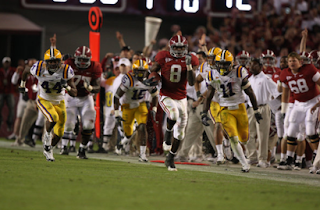 Did you know it's been 10 years since Alabama beat LSU in Tuscaloosa? I did, I guess — LSU's been one of the best programs this decade (arguably THE best) while Alabama has been mired in ... well, whatever the better part of this decade has been. It's not a huge surprise that Alabama hasn't been able to compete with the conference's best. Still ... 10 years is a long time. I was a freshman in college 10 years ago. I hadn't even met the woman who eventually became my wife. I was living in a dormitory with a dude named Jeremy from Mississippi, spending most of my free time at the Wesley Foundation (across the street from my dorm) with a group of people I'd barely known two months (who would eventually become like my extended family). In football terms, here's how long ago 10 years is: the coaches the last time Alabama beat LSU in Tuscaloosa were ... Gerry DiNardo & Mike DuBose. Seriously. A few of us had a vague idea of who Nick Saban was, but not well enough to have any strong opinions of him. And certainly none of us had ever heard of Les Miles. That day in Tuscaloosa was pretty incredible: Alabama, playing without Andrew Zow or Shaun Alexander, took an early lead against a fading LSU team (Saban came the following season) and appeared to be winning comfortably, but the Tigers hit a few plays in the fourth quarter, then suddenly somehow had the ball with a chance to win on their final possession. Still one of the more incredible moments in recent Alabama history, considering that a) Josh Booty didn't throw the ball for whatever reason (and he had a man open); b) Marvin Constant ended his career keeping him out of the end zone (he ruptured most of his right leg on the play); c) our friend Koroknay went crazy and doused poor Peter, who's never really forgiven him for it. LSU (the 2009 version) is better than I was willing to admit. In the lead-up to the game, I stubbornly refused to capitulate to them being any good: they hadn't shown me anything terribly impressive, had suspect quarterback play and even more suspect coaching. Moreover, we were playing at home (for whatever that's worth), had two weeks to heal and prepare and had advantages at just about every position. Frankly, I believed, with a break or two early, we might just blow LSU out Saturday. It became clear from the opening bell that a blowout wasn't happening. Whatever Les Miles' teams lack in discipline and precision, they make up for it in tenacity and a scary amount of skill. Every time one of those long, lanky receivers (who LSU apparently builds on an assembly line) touches the ball, it seems like he's a threat to take it the distance. From any spot on the field. There's no other way to say it: LSU dominated the first half. It might not have shown up in the final statistics, but everything about the first half of play leaned in the visitors' favor. They were driving the ball, had our defense confused, had our offense looking a step slow. Make no mistake: the game was there to be lost. But, just like what happened in Week 1 vs. Virginia Tech, this team found ways to hang around, kept things close until the fourth ... and then it happened. "We're going to win," the coach said, "with or without you." Clearly, Saban wasn't interested in catering to the dude's ego — he wanted him to know he could either be a part of something special, or he could watch it from somewhere else. It's been clear all season that the offense won't cater to Julio's ego, either: even Greg McElroy made it clear during the season that he wouldn't force the ball to his star wideout just to make him happy (even though he still does, occasionally — more on that in a second). Early on in the fourth quarter, an inexcusable error by (you guessed it) Julio cost Alabama a real shot at 7 points — faced with 3rd-and-goal at the 2-yard line, down 15-10 with a running game that was dominating at the time, the Tide brought in its jumbo package to pound out two more yards and re-take the lead. Only Julio didn't get off the field — instead, Alabama broke the huddle with 12 players, took a 5-yard flag and wound up settling for 3 points. On the television replay, you could see Saban — the same guy who challenged Jones two years ago — spike his headset furiously, asking how someone who should know better could commit such an egregious mistake. Let's just say, it appears our boy got the message. Just like with that victory 10 years ago, there remains work to be done, this team is going back to the SEC Championship Game. To face Florida again. Also, there's still work to be done, just as there was 10 years ago (and last year, for that matter). This trip to Starkville could end the party prematurely, no doubt. Even so, we should all drink in the moment. If we've learned nothing else from the last 10 years, it's that you never know when you'll get back to the top. — Of course, the talk this week will once again be about officiating, after Patrick Peterson's (apparent) interception inexplicably didn't hold up on replay. I have no explanation and no defense — it was a poor call in the midst of a season that's been (unfortunately) marked by poor calls. But when you just watch the fourth quarter, it's impossible to blame this on one call. LSU went into the tank when the game mattered most. No first downs in the fourth quarter. The officials didn't do that, LSU's offense did. Julio Jones getting a long TD catch off a screen pass untouched, that wasn't the officials doing, that was the LSU defense. — I'm enjoying the Greg McElroy love as much as everyone else this week, obviously, but can we tone it down just a little? Maybe 12 played better this week than he did in October, but he wasn't exactly Tom Brady out there, either. In order, McElroy missed at least three passes that should've been touchdowns (to Marquis Maze, Julio & Brad Smelley); threw a terrible interception right before halftime (Maze, once again, was wide open at the goal line) and didn't get the ball out of his hands in time to avoid a killer safety. Oh, and let's not forget that the "should've been iNT incompletion," in which McElroy stupidly tried to force a sideline pass in between three defenders. I'll give the kid credit, obviously: the touchdown pass to Hanks was fantastic, and he did make several big throws down the stretch. He's not a bad quarterback. I'm just not ready to kiss him on the mouth because he played "average" on the big stage. Also, he runs like a girl. That's disconcerting. Brodie Croyle is embarrassed by McElroy's scrambling ability. — Better than average: Leigh Tiffin. All comparisons to Ryan Pflugner are officially shelved. For good. — Speaking of LSU fans, the vibe from those guys was totally different this time around from 2007. I think they're finally starting to come down off the Nick Saban thing. Kinda. — Les Miles' famed "injury timeout" tactic is starting to get a little transparent. Just saying. — Here's how good Marcel Dareus is: on LSU's last meaningful possession, I saw him lining up over the guard on third down and thought to myself, "He'll kill that guard." And he did. He really did. — Still not sure what happened to Jordan Jefferson. On the replay, he looks fine. Also, can anyone figure out why Gary Crowton won't feed his running backs more? Do Crowton, Jim McElwain and Al Borges all attend the same offensive philosophy classes? "Over-thinking, 101?" — Special teams play yesterday was fantastic on both sides. LSU's punting unit killed two kicks inside Alabama's 5-yard line, and eliminated Javier Arenas as a threat on all but one kickoff return. As for Alabama, in addition to Tiffin, the kickoff coverage unit finally rounded into form — I don't think LSU started a possession beyond its own 30 off a 'Bama kickoff. Well done, guys. — On a critical fourth down last night, needing a half-yard ... Alabama ran Mark Ingram out of the Wildcat. Hey, I'm glad it worked. Just don't think for a minute that i thought that was a great idea. — It was quite an experience for my wife's uncle Larry, who brought a date with him all the way down from Illinois for the weekend. It's not everyday you get to see 95,000 screaming people shoved into the same space for four-plus hours. I like to think they enjoyed themselves. I hope so, anyway. You never know when you'll be back. WouLd you please explain exactly what McElroy could do that would make you ready to "kiss him on the mouth"?